Through the Eyes of an Intern, No. 2: What pine tree? Which clump? 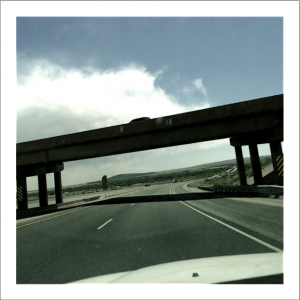 /Hawks Aloft Inc. Through the Eyes of an Intern, No. 2: What pine tree? Which clump? Well. So much has happened since my last post that I don’t even know where to start. I had my first real field work experience with Dave Parsons, a volunteer, and Jennifer Goyette, our very cool new biologist, three Thursdays ago, and I was planning to write about that. 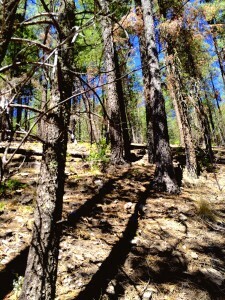 Then I had my first REAL field work experience a week ago, in the Gila National Forest. I spent the time with Mike Fugagli, one of our avian biologists, searching for Mexican Spotted Owl fledglings. Yes, I saw impressive adult owls and adorable baby owls. Yes, I camped in the car and didn’t shower for three days. And, yes, I got the notice to travel, packed up the car with food and camping gear, and drove six hours to a place I’d never been before within one day. 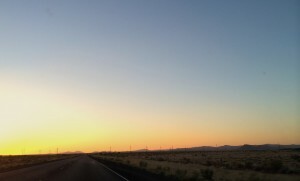 I am slightly proud of myself, especially considering that this was my first long-distance solo road trip. 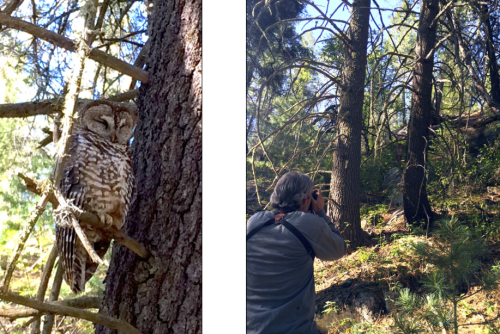 Mike taking pictures of the first owl, the father of a nestling or two who hadn’t yet fledged (left the nest). Still, though, he looks pretty happy, so I’m guessing everything is going well with his kids! This was the first Spotted Owl we spotted and, through some stroke of luck, I saw him before Mike. Lucky because that man is quite honestly one of the best bird identifiers and trackers I’ve ever met, and I feel so privileged to be able to work with him! Just sitting around the camp table on the first morning, drinking some cowboy coffee and watching the wildlife around us, he was able to identify at least four different bird species by either sight or call and show me two different nests right next to our campsite. Can I be like him when I grow up, please? Photo of a mother (left) and her baby, by Mike Fugagli. For another of just a fledgling, see this lady’s shot. We visited six nest sites, five of which had owls present. Four of those had fledglings, including two with two fledglings! This is actually very important because Mexican Spotted Owls are listed as threatened by the Fish and Wildlife Service and two fledglings are much harder to raise than just one. As Mike put it, it’s kind of like raising a cottonwood tree: easy at first because it grows quickly, nearly impossible to keep it going once it has a 30-foot diameter canopy since it has to be watered at the drip line, which is where the canopy ends—sort of an exponential increase in necessary inputs to get the same output/a not-dead tree in your yard. 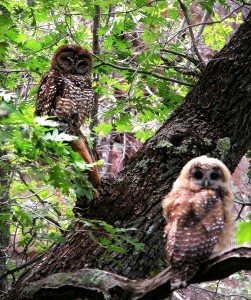 But back to owls: finding these guys—whether the adults, the fledglings, or especially their nest—was quite challenging. The title of this blog comes from the second-to-last site we checked, when Mike said that the nest was “a clump in that pine tree” and, naturally, there were about twenty such combinations in the direction he pointed. It was always rewarding when at last feathers materialized from bark and I could actually distinguish the owl. Probably my favorite memory is when I saw my first fledgling, or, as I like to call them, puffballs. There’s really no better way to describe these absolutely adorable young owls. Fitting that a Capricorn (mountain goat) should try to scramble up this hill. This and its brethren had a greater than 30° incline in some places and I am most definitely counting them as sufficient cardio for the next two or three weeks. I was pretty sad that this trip was so short, despite climbing ridiculous hills and dealing with ever-present bugs and access roads that would be politely described as “extremely potholed.” But I’ll always keep the memory of this very first field work trip, and the best part is, I still have several weeks left of field work, including one next week to the Valles Caldera with Jennifer. I’ll write about that next time! Until then, happy trails.